I grew up listening to baritone saxophone hero Nick Brignola play all around the Capital District, so it’s nice to hear a younger musician pick up the big horn and continue the tradition of swinging mainstream jazz. On this album, Brian Landrus plays baritone saxophone and bass clarinet, along with Michael Cain on piano, Lonnie Plaxico on bass and Billy Hart on drums. 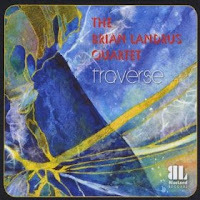 Opening with the title composition “Traverse,” the music is a mellow quartet improvisation, swinging, with nicely controlled sax soloing over rhythm, making way for a piano, bass and drums trio interlude. “Gnosis” has a mellow and mild groove, with the band playing at a low, patient level, while building quiet power. Given the title, “Lydian 4” I assume that this composition was influenced by the composer and theorist George Russell. It has a faster pace, medium up tempo with probing piano accompaniment and a subtle bass solo. The next two tracks, “Soul and Body” and the standard “Body and Soul” seem to nod in Coleman Hawkins’ direction with the first being a slow low baritone solo unaccompanied, and the latter nicely transitioning into a mellow ballad, complete with late night feel with shimmering cymbals. Subtle bass solo with piano comping completes the picture.”Creeper” takes the band on a mid tempo, nice subtly swinging journey. Deep throaty baritone picks up to strong swing before launching a piano solo along with a thick spacious bass solo and subtle percussion interlude. This was a solid and swinging album, quite accessible for fans of mainstream jazz or famous baritones of the past like Brignola or Gerry Mulligan. Traverse - amazon.com.